Apprenticeship is an “earn and learn” model in which apprentices earn wages from the first day on the job. There are over 150,000 employers within more than 1,000 occupations, including Advanced Manufacturing, Construction, Energy, Finance and Business, Healthcare, Hospitality, Information Technology, Telecommunications and Transportation. Using apprenticeship as a workforce strategy will contribute to higher performance outcomes in employment, retention, earnings and credential attainment. WIOA identifies several strategies for a more responsive and successful workforce development system: Increased focus on youth, sector strategies, career pathways and business as a partner. These strategies are at the heart of the apprenticeship model. The foundation of apprenticeship is built upon responsive and complete industry engagement that can support regional economies. 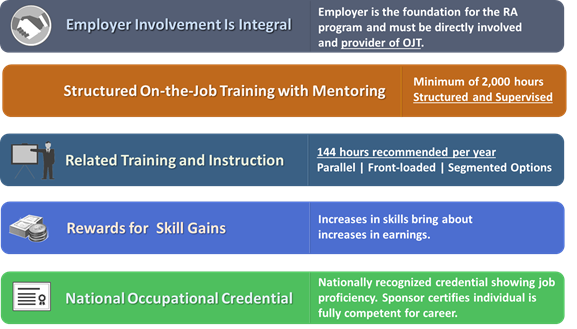 WIOA includes several changes that strengthen Registered Apprenticeship as a resource, a training strategy and as a partner in the workforce system. WIOA specifies inclusion of a member of the apprenticeship system on state and local workforce boards. WIOA puts Registered Apprenticeship programs on the Eligible Training Provider List making apprenticeship sponsors eligible to receive federal workforce funding. WIOA supports apprenticeship as a workforce strategy for youth. WIOA promotes greater use of work-based learning and a stronger emphasis on business services. With employers being at the center of the apprenticeship model, industry is automatically at the table. Therefore, apprenticeship aligns perfectly with sector strategies, industry partnerships and other investments in meeting the needs of the business community. Updated in January 2017, the Final Rule for Apprenticeship Equal Employment Opportunity (EEO) opens more doors to apprenticeship programs for traditionally under-represented groups, including people with disabilities. The final rule expands the requirements to include affirmative action obligations on the basis of disability, including a 7 percent utilization goal for individuals with disabilities in apprenticeship programs. The Final Rule also establishes a mechanism to request applicants and apprentices to self-identify as having a disability. Under WIOA, VR has a dual customer. Therefore, it is important that services and supports not only lead to value and positive employment outcomes for consumers, but also meet the needs of the business customer while still fulfilling the mission and outcomes of the agency. Articulation agreements between certain apprenticeship training programs and two- and four-year colleges that create opportunities for college credit and future degrees. Value to SVRAs:Apprenticeship is an effective method for SVRAs to achieve outcomes. Employment at 2nd and 4th quarter: Apprenticeship is an “earn and learn” model offering employment from day one. Registered apprenticeships vary in length but require a minimum of 2000 hours (more than 2 months). Median earnings: Registered apprenticeship programs have built-in earnings gains as skill gains are achieved. Measureable Skills Gain: The apprenticeship model has an increasing skill gain built into all registered apprenticeships. Credential attainment: All registered apprenticeships end in a nationally portable, employer recognized credential. Employer Engagement: Apprenticeship is a direct response to the needs of businesses to provide a qualified workforce that meets skill needs in high demand industries. 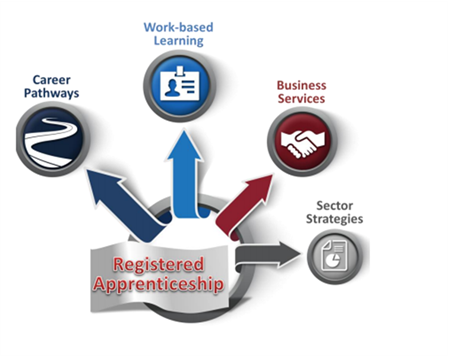 ALL Registered Apprenticeships are in a competitive integrated setting. Although Pre-ETS funding cannot directly pay for apprenticeship or pre-apprenticeship, counseling on occupations available under this model can be included. In addition, informing youth of a pathway to self-sustaining employment outside of the traditional post-secondary environment can be provided to facilitate choices.